Zebra's new approach to card printing�and its impact on businesses that rely on card printing technology�follows. The ZC series printers offer advanced printing options to create virtually any design users dream up. You dream it, ZC printers can print it�single- or dual-sided, color, black and white or metallic. 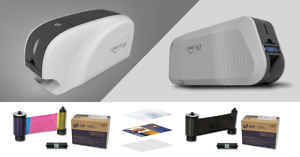 These printers can even embed security marks on the fly�a first for printers in this price point. It�s fair to say Zebra has created a ground-breaking �fits-everywhere� design that�s at home in any business space�providing truly superior deployment flexibility. With the slimmest profiles and lowest clearance in their class, the ZC series printers fit practically anywhere. They work exceptionally well in smaller work environments where desk space is limited (retail and hotel desks, security stations), and equipment should fit visually into space design and branding by not standing out. Customizable cover side panels (choose your color) create a printer that fits the visual environment, is consistent with user�s brand identity, and has the sleek appeal to work in customer-facing areas. Also, users can now remove side panels to access the printer�s interior�for a quick fix when the unit needs attention/service. 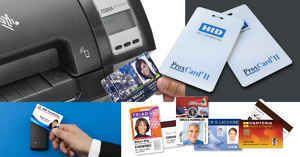 This is a handy touch for customer-service or security personnel/areas printing cards on the fly. The ZC100, ZC300 and ZC350 Series card printers now feature innovative card feeders that automatically adjust to each card�s thickness as they�re fed in�sparing personnel the need to stop everything and manually adjust card-thickness settings for different card types. For dual-side printing, the ZC models feature an optional �flipper� module, which is field upgradeable. Zebra has made card printing easier and faster by adding hinged doors on the card output hopper and redesigning the ribbon door to simplify ribbon loading and unloading. These new design improvements make Zebra's improved card printers less complicated and more efficient than previous models. The revolutionary hopper design means loading/unloading cards is easy, fast and efficient. A unique door-handle-style grip leaves no question about how to remove or insert the ribbon. With only one way to insert the printer ribbon, users are never confused about inserting ribbons correctly�fool-proofing ribbon changes. With smart chips in the ribbons, users know to change ribbons before they run out, avoiding printer downtime delays. These design improvements enhance utility and complement the printers� profile and space requirements. Security is a primary concern for card-printer users�for the cards and the card printers. For dual-sided printing with the ZC Series, users have the added security option of directing finished cards to a secure 10-card bin within the printer. An optional printer cover lock secures all media, card stock, ribbons, and printed cards�a security feature that enables no-risk card printing in public-facing spaces. For users managing advanced security requirements, Zebra incorporates printer-to-host authentication firewalls to block printer intrusion (i.e., unauthorized applications or mobile devices attempting to print cards), and government-grade encryption to protect sensitive data. The ZC350 offers three new ribbon choices featuring specialty colors and special effects, such as tough-to-forge color-shifting graphics and watermarks only visible when tilting the card at an angle or viewing it under UV light. The new ZC series driver features a simple graphical user interface for managing the printing process and card appearance. One negative observation: the printer must remain connected to the user�s PC to access the driver. If the printer isn�t connected, the driver won't load. This unfortunately scuttles remote maintenance and driver demos. Increase productivity with industry-leading print speeds�up to twice as fast as some competitive printers. 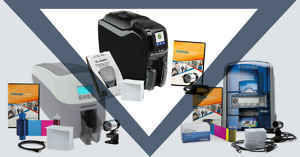 A key consideration when selecting an ID card printer is the user�s anticipated ID-card print volumes and the printing rate necessary to accommodate those �crunch� production times when print volume and pace must keep up with real-time workflow. If your business needs to print personalized cards quickly�and on the fly�the Zebra ZC Series printers can print single-colored ID cards in less than five seconds, a truly amazing feat in the card-printer world. They print up to 225 cards/hour (color) or 1,000 cards/hour (mono), single -sided. Speaking of security, the ZC350 offers smart-card encoding such as contact and contactless encoding, along with typical magnetic-stripe encoding. New in these printers is the ability to read proximity and iClass cards. With support for just about every encoding technology, users have true card-printing flexibility can create any card type � credit, debit, identity, access, loyalty, public transportation passes, and more. This is true encoding flexibility�and the ZC350 supports it all right out of the box. ID Cards � Print high-quality ID cards for employees or students or issue highly-secure government credentials to identify every person at a glance. Access Control Badges � Track who enters and exits properties and places with access-control badges to secure the enterprise, school, building, or area. Time and Attendance Badges � Your Zebra ID card printer allows you to track your employees, visitors or students and even print a schedule on card backs. Payment Cards � Issue payment cards, gift cards, or IDs with cashless payment options. 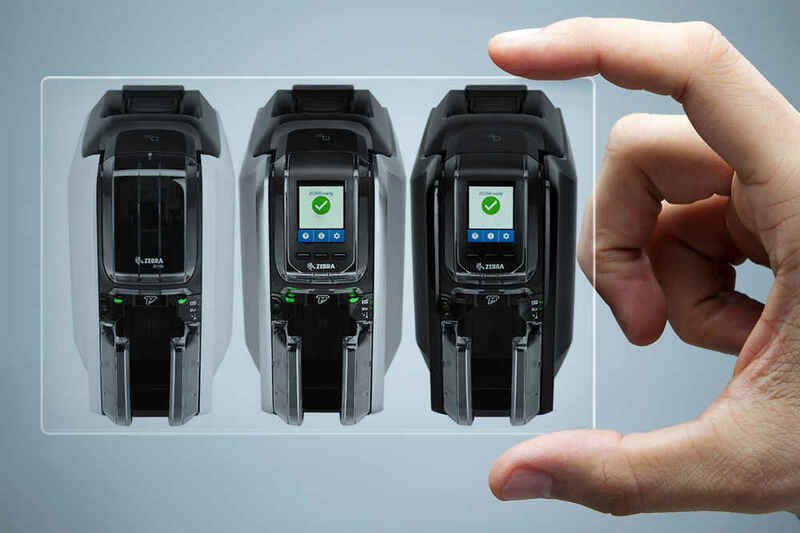 Zebra�s design team elegantly engineered the ZC series to address and eliminate the primary card-printing pain points and provide push-button simplicity. 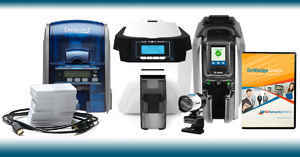 The Zebra ZC Series of ID card printers�three models to choose from covering all bases including single or dual-sided edge-to-edge monochrome and color cards, with new ribbons that offer specialty colors and special effects�is an excellent line, loaded with advanced card-production features you�ll want to consider when evaluating printer options. These printers are compact, lightweight, and designed to reliably issue superior-quality ID cards and badges for all users/enterprises and applications. 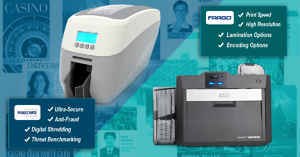 Zebra ID Card Printers instantly issue high-quality ID cards for maximum security. When you want it all in a card printer, Zebra�s ZC series printers deliver it all. Pretty simple.